The Estrela Mountain Dog is a large, attractive, and noble-looking dog that hails from Portugal where they were bred to herd and guard livestock and homes of their owners in the Estrela Mountain regions. They are known for their courage, loyalty, and intelligence, as well as their kind and affectionate natures. This dog is also known as the Cao da Serra de Estrela. Because of its size, it is a formidable opponent to even large predators. It does well as a companion and a guard dog. If you are looking for a dog that will be good at protecting your property and your family, especially your kids, the Estrela Mountain Dog makes a wonderful choice. The Estrela Mountain Dog has a large and athletic build. What Price are Estrela Mountain Dog Puppies? The price of Estrela Mountain Dog puppies starts at $1,000. How to Find Reputable Estrela Mountain Dog Breeders? You will locate the most reputable breeders by visiting the breed club’s website, accessing their member directory, and getting in touch with them through email or phone call. Few good breeders have a website, and even fewer have good websites. Reputable breeders don’t have a special license or certificate. You will need to talk to them to determine if they’re worth getting a dog from. Visiting dog shows or dog events is an excellent way to find good breeders, meet their dogs, and find out more about the breed. Not all reputable breeders will be listed on the club’s online directory, so you may want to get in touch with them at dog shows and dog events. Of course, not every breeder on the club website or at dog events will be reputable or responsible, so it’s important to find out as much as you can about their breeding practices. Remember to ask these questions like you would in a casual conversation and not in an intimidating or accusatory kind of way. The breeder is someone who will act as a resource for the life of your dog. They will also need to interview you to see if you are a good fit for their puppies. It’s highly recommended that you visit the facility and meet the parent dogs before committing to purchasing a dog. Be wary of a breeder who is not willing to let you visit. Have the willpower to say no if something doesn’t feel right when you go see or pick your puppy up. You can find more information about their kennel, their breeding process, and what other dog owners have to say about that breeder. If the breeder you are interviewing does not pan out, that’s alright. You can go to the next one on the breeder directory on the website. Never rush into getting a dog. The decision to get a dog from a reputable source will be more than worth it. Not only will you be buying a premium quality dog, you will also be gaining a lifelong resource. Your breeder will be there to support you through every bump in the road if you so require it. Considered one of the oldest breeds in Portugal, the Estrela Mountain Dog has been protecting flocks of sheep for many centuries. A brave and intelligent dog, shepherds depended on the Estrela Mountain Dog’s ability to identify and scare off wolves and other hungry predators. Eventually their skills were used to guard large estates by local aristocrats. By the 19th century, the number of Estrela Mountain Dogs used by local shepherds had begun to fall. The Estrela Mountain Dog is comfortable with other pets. The Estrela Mountain Dog is a large dog with an athletic build. Their coats can either be long or short. 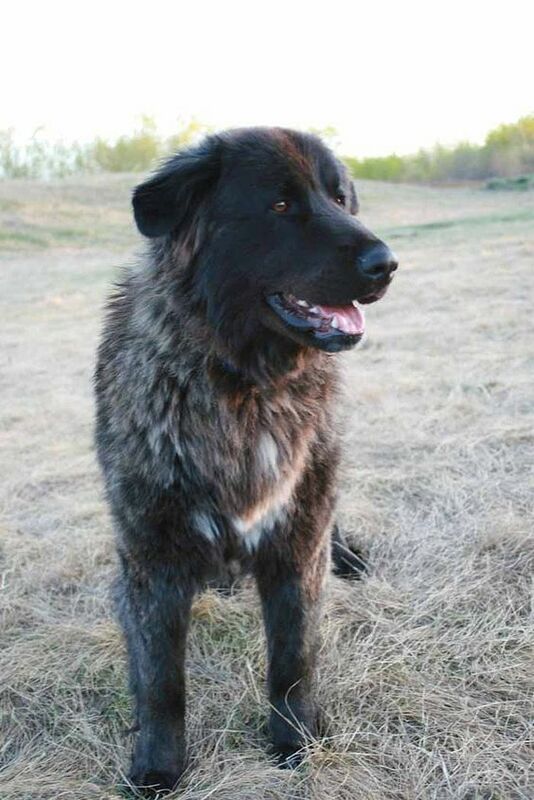 The long-haired Estrela Mountain Dog has a thick and sort of coarse external coat that can be flat or wavy. It has a dense undercoat that is usually lighter-colored than the outer coat. The short-haired Estrela Mountain Dog has a similar outer and undercoat, but it is comparably shorter. The coat is usually colored yellow, wolf gray, or fawn, with or without brindling. There may also be white markings or black shadings throughout the coat. Blue coloration is sometimes found but is considered undesirable. 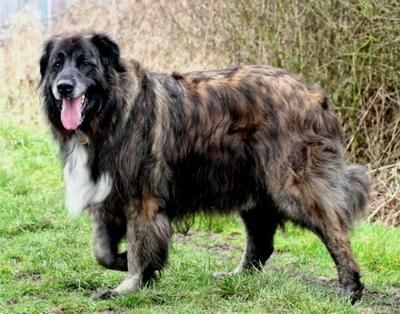 The Estrela Mountain Dog has droopy ears and a long, bushy tail.Their rough hair does not tangle easily, though it has the tendency to mat at the back of the ears. The coat usually needs just one thorough brushing every week. The Estrela Mountain Dog tends to roam if not placed in a large and securely fenced yard. Nevertheless, it can flourish in a smaller area as long as it is taken out frequently to exercise. How Big is a Full-Grown Estrela Mountain Dog? Male Estrela Mountain Dogs can grow to 25.5 to 28.5 inches in height and weigh approximately 99 to 132 pounds. Females stand 24.5 to 27 inches tall and weigh 77 to 99 lbs. What is the Life Expectancy of the Estrela Mountain Dog? The Estrela Mountain Dog has a life expectancy of 12 to 16 years. The Estrela Mountain Dog is known for its courage, loyalty, and intelligence. The Estrela Mountain Dog is peaceful and quiet, but he will not hesitate to defend the humans he loves, making him an impressive guard dog. He is often distrusting of strangers and will need proper training and socialization as early as possible. Although he can be dominant at times, he can get along well with other household pets. However, it may take some time for him to get accustomed to another dog in the home. 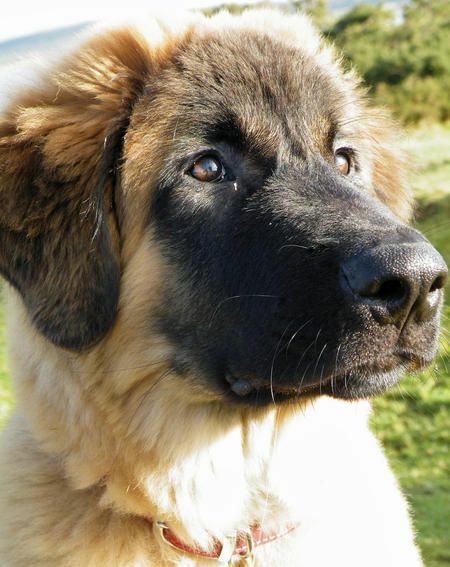 The Estrela Mountain Dog is not an aggressive dog, but he has very strong protective instincts. He will not hesitate to come to the rescue of those he loves. These dogs are calm and fearless. They are intelligent, loyal, and affectionate with family, though they tend to be aloof around strangers. They do have a tendency to bark, especially in situations where they feel their territory or family may be threatened. Because the Estrela Mountain Dog is a large-breed dog, it should be fed a dog food diet formulated for large breeds. Large dogs have somewhat lower energy requirements compared to small dogs, so a regular dog food formula might result in weight gain. If your dog is particularly active, however, it may benefit from switching to an active breed formula. Breeders will give you a feeding schedule. It’s important to stick to the schedule, feeding the same puppy food to prevent tummy upsets. You can change a puppy’s diet, but this needs to be done very gradually, making sure they don’t develop any digestive upsets. If they do, it’s best to put them back on their original diet and discuss things with the vet before attempting to change it again. Because they are prone to suffer from bloat, they should be fed twice a day instead of giving them just one large meal. It’s also a good idea to invest in a stand to place their feed bowl. This makes it easier for them to eat comfortably without stretching their necks very low to reach their food. You should not exercise them before or after they have eaten because this will put them at higher risk of developing bloat. How Much Exercise Does an Estrela Mountain Dog Need? Estrela Mountain Dogs are known to be athletic, energetic, and intelligent dogs. They need to be given the right amount of daily exercise and mental stimulation. This also has to include lots of “off leash” time so they can really express themselves. However, as with any other breed, the areas where they can run free need to extremely secure. Care needs to be taken when they are around dogs that they are not familiar with. Estrela Mountain Dogs need a minimum of an hour’s exercise every day. But the more they are given, the better. A shorter walk in the morning would be fine, but a longer and more interesting one in the afternoon is a must. These dogs also like to be able to roam around a back garden as often as possible so that they can really let off steam. However, the fencing needs to be extremely high and secure to keep these large, energetic dogs in. If they find a weakness in the fence, they will soon escape or jump out and get into all sorts of trouble. The Estrela Mountain Dog can leap to great heights. Your back garden must have extra high and extra strong fences to keep these big and athletic dogs safely in. The Estrela Mountain Dog is a healthy breed. Although they are quite healthy dogs, they can still be affected by some of the health problems that affect other large breed dogs. These include hip and elbow dysplasia. The Estrela Mountain Dog is an intimidating opponent for any hunter because of its large and athletic build. They are affectionate to owners but aloof and wary towards strangers. They get along well with the children of the family, being very protective towards them. Though they are comfortable with other pets, they may have a concern in mingling with other dogs in their household because of their independent nature. Socialize your Estrela Mountain Dogs by acquainting them to different experiences. They will gradually be able to differentiate the good from the bad. Regular visitors to your home can bond with them by rewarding them with a treat or plaything for every gentle behavior.